Welcome to all who are viewing this project from Pinterest! I hope you check around the blog and then subscribe for future projects. If you are interested in additional 20th Century artists, you may be interested in my Harmony Fine Arts Grade 4 or Grade 8 plans in ebook format. You can click over and read the details and find lists of artists covered in each year plan. It is funny how things work out. 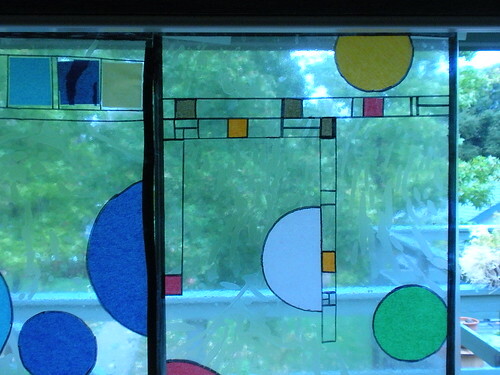 After posting our Tiffany Glass project a few weeks ago, Dana at School For Us posted a comment about how they used the Tiffany Glass project to follow-up on their study of Frank Lloyd Wright. I thought they did an excellent job and so when I was paging through the Great American Artists for Kids book, I was pleasantly surprised that there is a project for FLW as well! The Bubble Window project looked like something fun to try. We gathered the materials and waited for some free time to explore his glass art and to complete the project. 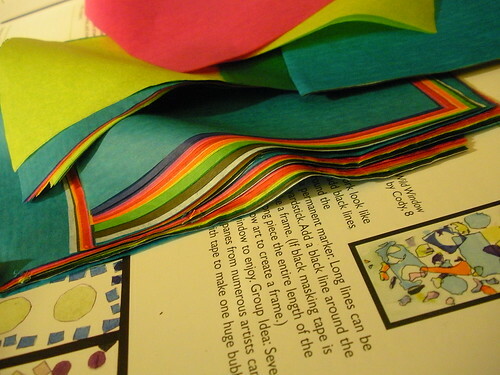 Again the Great American Artists for Kids book came through with a project using simple materials we had on hand. We started off viewing some of Frank Lloyd Wright’s art glass and getting an idea of how he used shapes and colors. It was a little different than Tiffany did in his artwork. 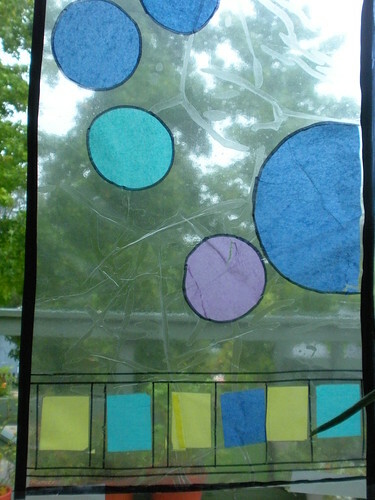 My sixteen year old and I decided to each make a separate panel that we could hang together on our schoolroom window. We measured the length and and cut a piece of contact paper without removing the backing to get started. 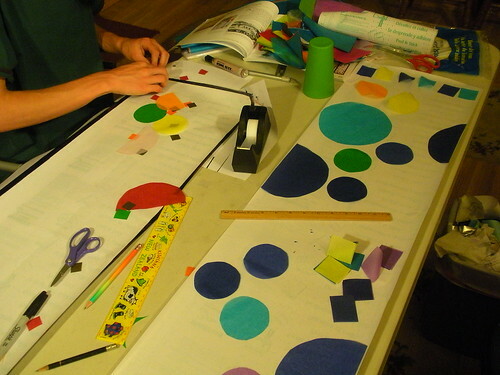 We started off by cutting circles and squares out of tissue paper. We used cups and plastic container lids as circle templates. Before we pulled the backing off the clear contact paper, we placed our design down to get an idea of how we wanted to stick the tissue in the final pattern. After we had our basic design planned out, we each decided on different ways to complete the project. My son decided to pull off the backing, lay down the tissue, and use a Sharpie Marker on the sticky back to make the black lines. I opted to pull off the backing, lay down the tissue, layer the other piece of contact paper, and then use a Sharpie and black electrical tape to make my lines. 1. The Great American Artists for Kids book rates this as a 2-star project. I think it definitely needs to be a 3-star project since I would never expect a child to complete this project without a lot of adult help. I would absolutely say to do this project independently the child would need to be a mature middle schooler. 2. We had trouble with the tissue paper sticking where we did not want it to stick. Sometimes we were able to remove it from the sticky paper, but sometimes it was just plain stuck and we had to incorporate it into the design. 🙂 The tissue paper also blows from the table and onto the contact paper like it has static. 3. 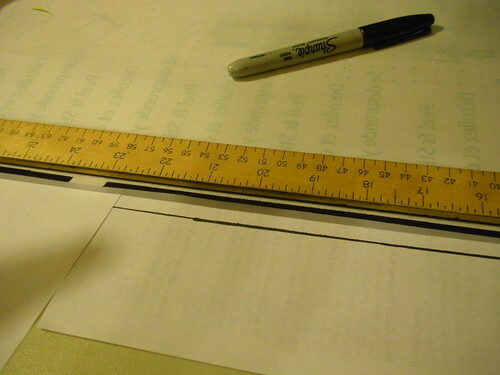 Use a ruler or yardstick you don’t mind getting Sharpie Marker on during the process. 4. Expect bubbles and wrinkles when you layer the contact paper. There is some room for smoothing it when you are done but for the most part, once it is stuck together you are left with wrinkles and creases. I think it just adds to the uniqueness of each panel. 5. 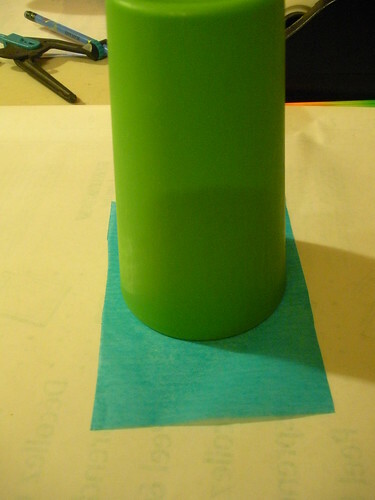 When you use the Sharpie marker on the sticky or the non-sticky contact paper, it will smear until it is completely dry. We tried to work from top to bottom with the Sharpie and that helped. 6. If you use black electrical tape for the black lines on the edges like I did, you need to make sure not to pull it tightly as you lay it down. The tape is a little stretchy and it will curl your panel up. I loved this project and I would like to do it again sometime. The biggest thing I would change would be to make my panel much smaller so it will be easy to work with. The size of our project was hard to handle and we had to fight to get the top layer of contact paper to lay straight and not have huge bubbles and creases. My son and I worked on this project for over two hours start to finish. Isn’t it pretty? Even on a rainy day it brought some nice color into our room. That’s super neat! I mean I really, really like it. I hope I can remember this idea when we roll around to Frank L. Wright. That’s going to be quite awhile. Hmmm… I better write it down somewhere. Cool, cool, cool!!! Thanks for posting this. So, I guess we’re really going to have to do this one. 🙂 We’re still listening to the Wright 3, so it’ll still work. And, I think we’ll take your advice and make our project quite a bit smaller. But, I do love it! The link you gave is actually to the artwork from the book that they use as an example of his work. I have a link on my sidebar for FLW so when you get to him, you can always come back and find the info on my blog again. That is absolutely stunning! I mean, really!!! Putting it on the “to do” list! It looks like you had a hard time with the wrinkles and other problems, but the finished panels look beautiful from a distance! You & Dana have inspired me too. 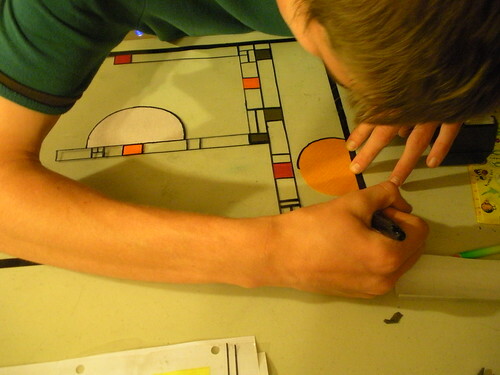 We are studying the rennaissance in history and one of the art projects is making stained glass windows – so we will do the stained glass project. This looks neat too, but probably too difficult for my girls yet. Thanks for inspiring us with the more modern art, I never would have thought! I’m thinking that this activity would go well with a study of Mondrian too. I like it! I too have been working a window treatment/FLW design around my head. I have a large piece leftover from a laminated project (i.e. the tail end of a project that was run through the laminator. I think I’ll experiment with that or perhaps just purchase a roll of drafting film. Oooh and I just remembered I have some sign vinyl (scraps from the local sign shop) that would work too. Love love love! Did you find the idea in “Great American Artists for Kids” by MaryAnn Kohl? This is one of my favorite projects in the book. It was fun learning about Frank Lloyd Wright because he’s mostly thought of as an architect. Yet his windows are spectacular, and the ones he has in a school are really fun for kids, with, for example a little hidden flag for them to find. Even the youngest kids can do this, and of course, expect developmentally normal results. I’m so happy to see your photos!! Really great. Oh, I just read that you did see Great American Artists for Kids! I should read before I talk! I have one question…..does the Sharpie line retain its crispness on contact paper. 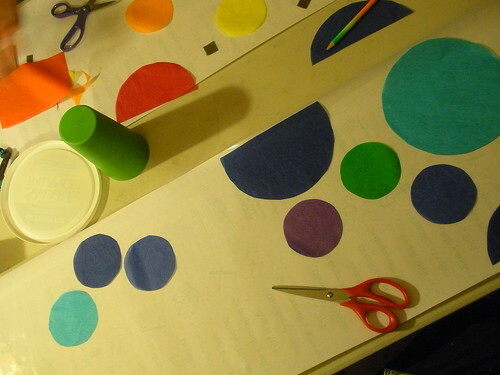 It was many years ago that I made some manipulative materials and used contact paper to cover them. All marker lines “spread out” or “ran” onto the contact paper. It was a lot of work that looked bad after a while. Perhaps the Sharpies don’t do that??? Sharpies don’t bleed like that on contact paper. Thank you!! That answer makes the difference in my doing this with my after school art club! It will be fun for these kids, and with an after school group and more time I can give them the assistance that you say they will need!!! thank you for such an interesting idea!! 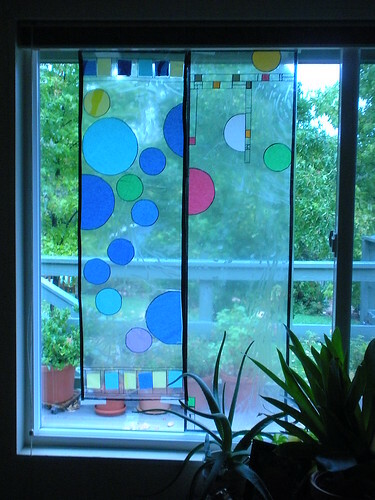 When I teach stained glass to my middle school students, I use the laminate that ends up between laminations. You might be able to get it free from Staples or Office Max if you tell them it is for education. Then we use acrylic paint and sharpies. I can not imagine trying to use contact and tissue. Total frustration. 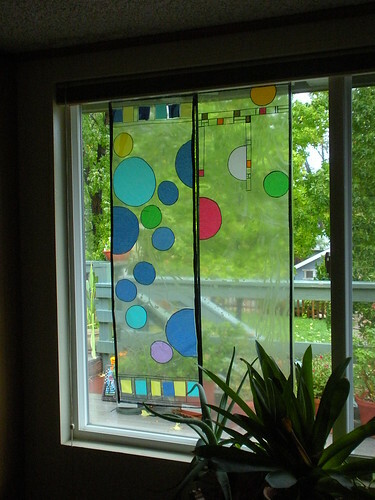 Personally, I am thinking of using either rice or velum paper with sharpies for my home project; privacy panels. Enjoy!